Gorgeous ALL-Carbon Body ’70 Dodge Charger with 950hp!! Check this, Gorgeous ALL-Carbon Body ’70 Dodge Charger with 950hp!! When it comes to American Muscle cars, there are many words that describe them, powerful, loud, fast, thirsty, and to be honest light has never been a word that first comes to mind when you are talking about the classic American muscle car. A fellow by the name of Dave Salvaggio however thought that he can do something about it so he decided that his project Muscle car needed to lose a couple of pound, so he went for an all carbo bodied 1970 Dodge Charger. The only metal parts on this beast are the floor and the frame which tells a lot about the strict diet that this car has been on, yes you read that correctly even the actual A pillar (and B pillar) are manufactured from aerospace carbon fiber. So what did all that light weight material bring to the scale and how does it feel with that 950 engine under the hood? Well watch the video and find out all about it. 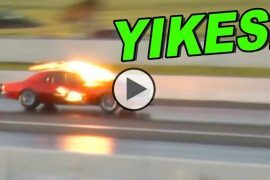 Street Outlaws Fireball Camaro vs. Daddy Dave in Goliath One Amazing Race! Get A First Look At The Next Season Of STREET OUTLAWS Coming This Fall! 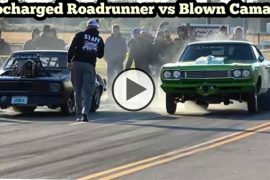 Procharged RoadRunner vs Blown Camaro at Streets of Wagoner Oklahoma!! Previous articleIs this the Future King of No Prep!? Street Legal Chevy S10 The Texas Rattlesnake!! Next articleBig Chief vs. Boddie In one hell of a race in Street Outlaws!!! 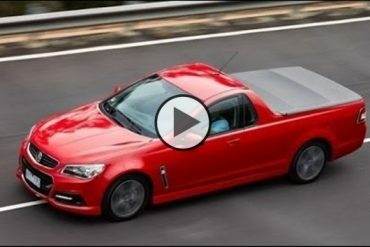 2018 Chevy El Camino – Possible Renderings?